Northampton MA Leaf Peeping | Maple & Main Realty . As a realtor and resident of New England, I suscribe to Yankee Magazine, which is a great resource for things to do in this part of the world. 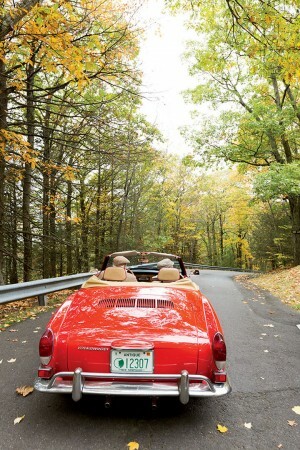 They recently published a "Western Mass Foliage Drive" article which outlines a beautiful drive through the areas surrounding Northampton. If you are looking for something fall-inspired to do this weekend (in addition to the Ashfield Fall Festival, that is) read on! For more information. any real estate needs, or to schedule a showing, contact us today! Discover recent real estate listings in the Northampton, MA area here. 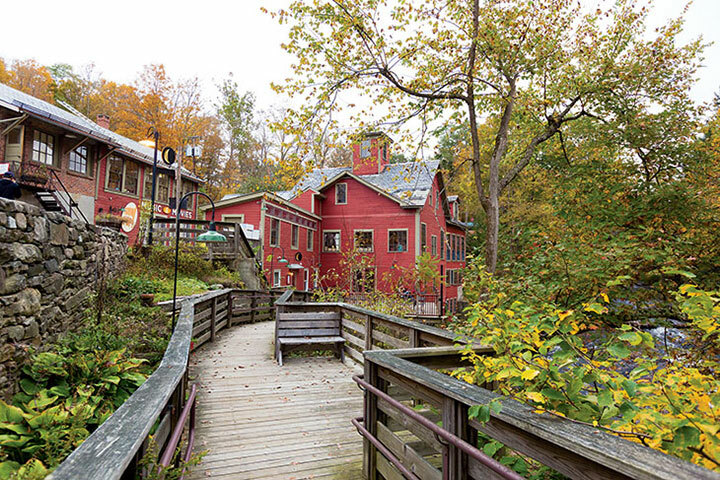 Housed in an 1842 grist mill, the Montague Bookmill offers a wide assortment of used books as well as a lively café. From the source of Route 47 in South Hadley and on along quiet roads to Route 63 in Northfield, our journey is a sinuous, hypnotic drive, with the Connecticut River flashing in and out of the trees like a bright ribbon. It's a day for farmstand hunting and lots of stops. Starting out, you'll want to grab provisions at South Hadley's Village Commons, from Tailgate Picnic or the Thirsty Mind coffeehouse, both across from the storied beauty of the Mount Hol­yoke College campus. Then launch yourself north on this sumptuously winding road. In Hadley, pull over at Barstow's Dairy Store & Bakery, which fronts Longview Farm, to watch cows grazing in the lower fields. Longview, designated a Massachusetts Century Farm, is actually a two-century farm, run by the same family since 1806, when Route 47 was a cart track. Drive through Skinner State Park to the summit of Mount Holyoke itself, where you'll gaze upon the Oxbow of the Connecticut River as it winds through fertile fields and dense forests. The 19th-century Summit House hotel reminds you of those grand old society days at mountaintop resorts. You'll pass many good farmstands through Hadley: Try Becky Sadlow­ski's, at the corner of her family's ancestral farm, Rooted Acres, right next to a tobacco shed and corn crib. On Sundays, the Olde Hadley Flea Market offers the most breathtaking backdrop of fields and mountains of any open-air shopping venue on the planet. A side tour on East Street will bring you to Hadley Common, where once villagers baited a witch, and where every fall they still hold a firemen's muster. Pull over to allow yourself a close-up of the curve of the Connecticut from the Hadley Dike. In season till mid-October, the Porter-Phelps-Huntington House Museum's warm, aromatic corn barn and the fish pond in its sunken garden are sights to behold, and the North Hadley Sugar Shack is a must for maple gifts for family and friends. Thre's one breathtaking view after another as you drive on through Sunderland; then detour left onto Route 116 to curve on up to the top of Mount Sugarloaf in South Deerfield, which ancient indigenous peoples said was the body of a giant beaver slain by a sky god. From the lookout tower, you can see the entire Holyoke Range in the distance, the silver flow of the Connecticut River, and the way the Pioneer Valley is held by the bowl of the surrounding mountains. Now backtrack to Route 47 to an old burying ground, Riverside Cemetery, just past a cornfield in Sunderland, whose old slate gravestones display soul effigies and epitaphs in archaic letterforms--a peaceful resting place since 1714. About six miles farther along, stop at the Montague Bookmill to inhale the scent of nearly 30,000 used tomes, and refresh yourself with lunch at the mill's café alongside a tributary of the Connecticut.Continue north to Turners Falls--home of the historic Shea Theater, funky stores, street gardens, and fish-shaped bike racks--a fine town to stretch your legs in; be sure to stop in for a drink at The Rendezvous or a snack at 2nd Street Baking Co. (which is actually on 4th Street). At the Great Falls Discovery Center, you can witness the churning energy of the old mill canal and learn more about this historic river you're following. Cross the river and Route 2, and head up Main Road into Gill; about a mile above the center you'll see North Cemetery on a little ridge on your left, flanked by open, grassy fields, calling you in past an ancient red-maple sentry to visit graves so old that some of them are coated in lichen, their inscriptions all but worn away. The light should be getting long by now, and you might need a jacket. Head right, over the river; then left on Route 63, ending your ride seven or eight miles north at the historic Northfield Drive-In (just over the line into Winchester, New Hampshire), its old car-radio pillars authentic testimony to its longevity. It closes after Labor Day, so there's one more great reason to visit the Valley again come summer. 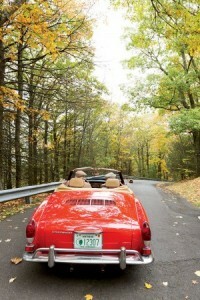 via Western Massachusetts Foliage Drive | Directions - Yankee Magazine.